If you ever doubted blueberries then this Wild Blueberry Compote with Honey Candied Walnuts and Brie should set things right. It’s a recipe that people have trouble containing their enthusiasm over because combining wild blueberry compote (a fancy French word for jam), walnuts and melt-in-your-mouth brie on toasted slices of our Cinnamon Raisin Pave creates the unavoidable “where have you been all my life” effect. We’re not kidding. It’s a dessert or an hors d’oeuvre, but you might end up making it the main course. Pre-heat oven to 350°F (176°C). Line a baking sheet with parchment paper. Stir together walnuts, honey and cinnamon until walnuts are fully coated. Transfer nut mixture to lined baking sheet and bake for 10-12 minutes until fragrant. Allow walnuts to cool completely before using. In a large saucepan over medium high heat, bring blueberries, sugar, lemon zest and juice to a gentle boil. Reduce heat and simmer for 6-10 minutes until liquid has reduced and coats the back of a spoon. Remove from heat and cool. Slice bread into 12 ½ inch thick slices. Toast or grill bread slices. Transfer toasted bread onto a lined baking sheet. Place 2 or three brie slices onto each bread slice. Melt cheese in 350°F (176°C) oven for 3-5 minutes. 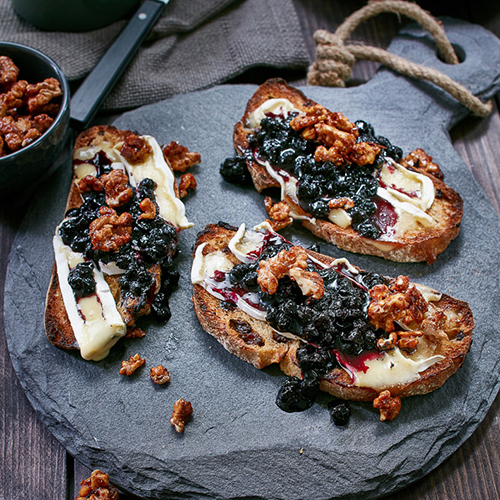 Top bread slices with blueberry compote and candied walnuts. Serve and Enjoy! Tip * Candied Walnuts can be made in advance and stored in an air tight container for up to 5 days. * Blueberry compote can be made in advance and stored in a re-sealable jar for up to one week.